The winter snow has dropped in all the great places of New Mexico from Taos to the Gila, and everywhere in between. You’re ready to get out and about with all of your friends, so you decide to rent snowshoes for a fun hike to the local hot springs. That sounds like a great time. Here are a couple quick tips to make your time out the best it can be. Let’s start with snowshoe basics, since not all snowshoes are created equal. The first two things to consider with snowshoes are the length of the snowshoes and and the bindings (how they attach to your boots). Bindings: There are as many different bindings on the market as there are snowshoes. So things to look for are ease of use and retention - how well they stay on your foot. I tend to use gloves while snowshoeing so I like to make sure I can articulate the bindings with my gloves on for minimal down time. Knowing the size range of the bindings will help pick the correct model as well. This is usually based off of shoe size. MSR makes snowshoes that fit Kids size 1 through size 15 Men shoes. How well do the bindings stay on your foot? Bindings that rely on simple nylon straps and friction are prone to slip and loosen when they become wet with snow while bindings with positive locking features or ratcheting/BOA systems will stay tight to your foot all day. Do the bindings themselves articulate within the snowshoe? Articulating bindings allow you to have a more natural gait while snowshoeing, especially with longer snowshoes. Is there a heel raiser or climbing bar? Though this is not a necessity to have it is nice to know what that thing is and how/when to use it. Lets talk size. Snowshoes work by spreading weight across a large area, effectively floating on top of the snow. So if you are heavier or you are packing additional weight you might need more flotation. The average snowshoe deck size is 22-25 inches, this will float upwards to 180-220 pounds based on snow conditions. If you and your gear are over that amount then you will need a longer snowshoe or a set of tails. MSR Snowshoes come with the ability to add tails via a two post connector in about 10 seconds. By using tails instead of dedicated, longer, snowshoes you can effectively have two sets of snowshoes for different purposes without the size and cost. Lastly, trekking poles can help make your day even better by providing additional traction and support while snowshoeing. Ideally your trekking poles will be collapsible - for easy storage and transportation - and will have removable snow baskets. The baskets will help with float the poles in the snow and keep your poles from bending as the snow warms up and consolidates towards the end of the season. Check out the pictures below and see some examples of today's topic. Bindings can very between models made by the same manufacture. Do these straps look glove friendly? This style of snowshoe is good for the adventure that is rather short and not too challenging. The webbing style binding works ok, but not a good as the MSR Brand and will deffently not last as long. 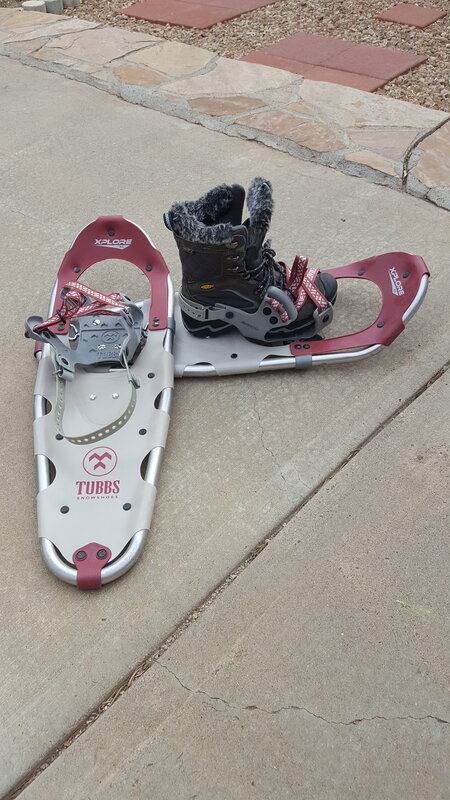 This is an all mountain style Tubbs Snowshoe, notice the climbing bar. MSR has done a great job making their bindings glove friendly, and fairly uniform between models. This is a great display of using the tails on the MSR EVO Ascent. They are snap and go! The MSR Evo has quick release options for the use of the tails. The MSR Tyker is made for little explorers. The binding is fixed, and the lateral crampons are made of plastic so as to not snag pants. Here is a sample of 3 different types of poles used for snowshoeing. They all adjust in height, and can accomidate a snow basket. MSR Bindings in the Evo Line are not foot specific.